Driving home this afternoon heard a Loud Pop from Drivers Rear Wheel, than looked seen dreaded Red ABC LOW warning, I had sneaking suspicion it was a hose as had my accumulators all replaced about 2 years ago and 8,000 or more miles ago. What is the easiest way to fix this hose and how the heck does it disconnect from where all the hose seem to run together on the bottom right. The upper portion seems it would take just a short wrench to disconnect from Valve Block by accumulator. 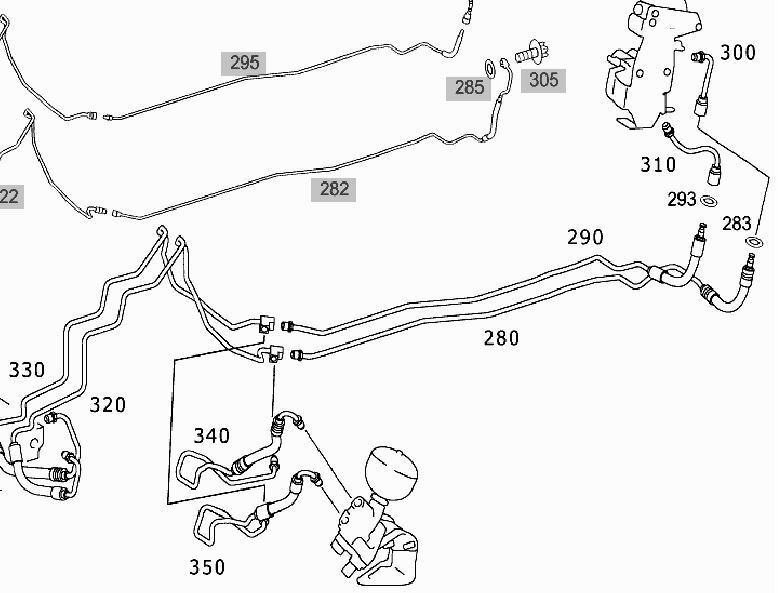 You need to trace it and see where it leads, you disconnect it from the valveblock and then trace it and disconnect it from the other end and replace it, that cluster of hoses do come apart, take a look at the bracket and you'll see. When you find out where it leads, then it'll be easier for someone to help you get a part number. Shouldn't be too bad of a job, do not start your car in the meantime, the pump might get damaged from running dry. I'm looking at wis and I believe it is the P High_pressure Supply Line from Tandem Pump. I hope that sucker does not run from the rear valve block to the Front pump under hood??? Awesome, that is a relief, I'm looking for the part number now, not having much luck thou. Try to see if there is a part number stamped on it somewhere, there might be revisions of the update hose but it should help. Hose has a quick disconnect fitting which requires special MB tools.You probably can get a fabricated hose and skip the replacement from MB. The fab shop can install a high pressure rubber replacement between the two metal tubes and eliminate the connection altogether. Looks like #280 on EPC Diagram. I took the Shield down and sanded some paint away from steel line, I than used Tubing Cutter to cut line loose as I have pictured, I'm thinking I could get some kind of Compression coupling for steel tube end, as if I order a new line I would do same sand paint off and tube cut it. I'm also thinking maybe get rubber line fixed some how as you said thou I need some kind of special tool. It does look like 280 if the right is back of car. Hard to tell. I cut it out almost the 1/2 way point under car. Check out posts from welwynnick and haoz129 both have done work on ABC. Haoz posts on Benzworld ad Nick posts on both forums. Nick rebuilds his hoses with compression fittings I think. Others have too. Do some research on models with ABC. If your hose is #280, the complete hose can be purchased for $75 or less but it will not include the pipe above the quick disconnect joint. if one can figure out how to get the joint separated, that would be the way to go, perfect fit. Well wish me luck on Friday's Project! Any tips I will take! So you took it to a shop and had a new rubber hose spliced in? Yes Rodney they put a new swivel joint and the hose is rated at 4000 psi. I'm also using a Hydraulic 4000psi rated compression coupling. When I was picking it up at shop we were making small talk and they noticed different hose on my car. If you look at my 1st picture notice the one that different. They said maybe someone did same thing before me on the other one, but I didn't see/notice any compression coupling on that line but will look when I start. Only thing I'm worried about now is I used a Dremel to remove paint on metal tube before tube cutting and made small very small flat area's. I hope that don't cause seepage. Keep us posted as to how it goes! All Fixed, I was getting Red ABC Warning once I topped off fluid so I had to pressurize the Fluid Tank, I used about 10psi. I got in started car started her up, heard a small pop,shot down car, removed pressure hose, re-started no Red Warning, I cycled the ABC Checking fluid the whole time. I then turned her off let her sit 10 minutes to 15 a few times re-checked fluid. I went for small drive cycling ABC and re-check fluid levels. I kinda screwed up routing metal tube I should of went over the return line as the High Pressure line went around wheel well. I couldn't secure the lines into 3 clamps and wasn't taking dang thing apart again. Tough working on ground. So I just buttoned her all back up and saved the clamps for another day. What did the fab shop charge for the replacement section? I have 130K on my car now and so far ABC has been almost flawless. Previous owner replaced RF strut prior and I did a fluid flush at 104K when I took over ownership. I also did a front valve block re-o-ring at 112K to eliminate a LF sag issue, otherwise no other problems. Love the car and will try to solve ABC hose problems as you did. I have a skinny wallet and live on a fixed income so DIY is the only way to own and enjoy this beautiful car! My '03 (45000 miles) has the same crimp on that line as yours Cadbob. I believe that is the low pressure return line from the rear return accumulator. Similar crimp up front at the pulsation dampener (which from a German thread somewhere repeated in this forum) is the return line going into the left front wheel well valve assembly. They charged me 160.00, I could of ordered from Mercedes and cut the line on new piece, where I cut off mine, but would of had to bought the quick disconnect tool or spend money on the O-Ring and New Metal Tube going to Valve block. All and All I may of spent 25.00 more I guestimating. When I was installing because it was only me I need to curve rubber hose so I could thread in the Metal Pipe to Accumulator valve, so I used tie wrap to pull hose so I could threaded in without the nightmare of cross threading. So my repair had lasted all last summer, but when I put her away under my carport for New England winter, there was some dripping of fluid coming down. Today is the first kind of warm day , so I checked to make sure ABC Fluid level was good and it was, so I started her up, yes the dripping is still coming down again, so have to pull wheel and wheel liner to see what is causing it. I will be shocked if it is the same High Pressure line. If it is I will try to come up with part number for the metal before swivel joint to Valve Block and the rubber after and replace with MB Part. If its not I think I will go same route as I did with High Pressure Hose repair. Damn ABC Issues! Was just reading through th thread, I may have skipped over it but why did you opt to repair over replacing the lie with factory part?